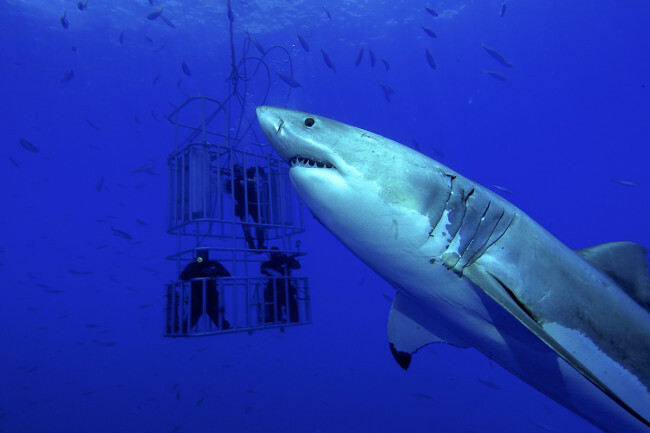 Great White Shark cage diving in South Africa is becoming a popular tourist activity because the country offers some of the best sites in the world having a large number of the Great White sharks in their natural habitat. During the months of May to October is the best time to experience a South African Great White Shark cage dive. Although these majestic predators can be seen throughout the year, during the winter months are considered to be the high season because water is warmer and the visibility better. 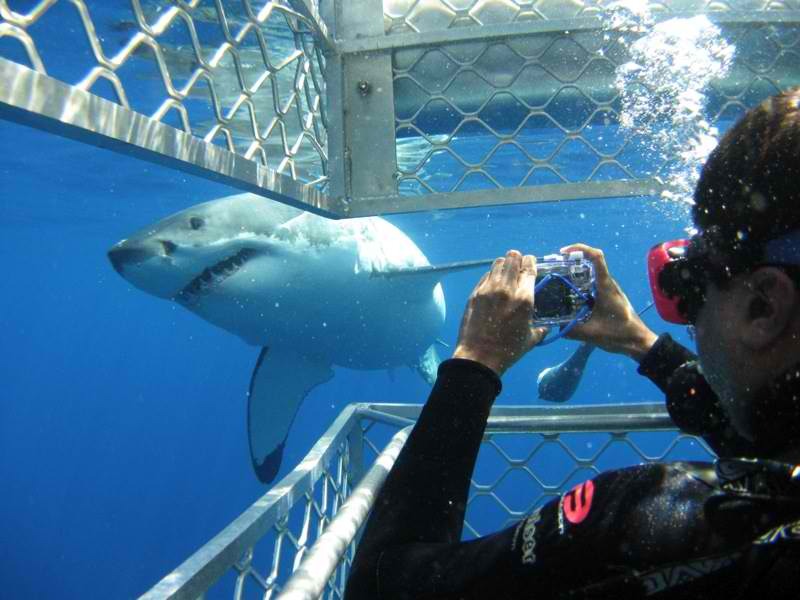 The Great White Shark cage diving is an adventure anyone should experience at least once in their lifetime. Yes, it may seem daunting to come face to face with the ocean’s greatest predator but it is definitely going to be an amazing experience. Yes. The South African cage diving industry is regulated by a Code of Conduct and regulations from the Marine and Coastal Management and the Department of Environmental Affairs and Tourism. In Cape Town, there are a number of shark cage diving operators who will accommodate all your cage diving needs during your trip. Not only will they see to it that you will make the most out of your shark cage diving experience, they will also unsure of your safety. Shark cage diving allows people to closely interact with the Great White Sharks while being protected in shark-proof cages. 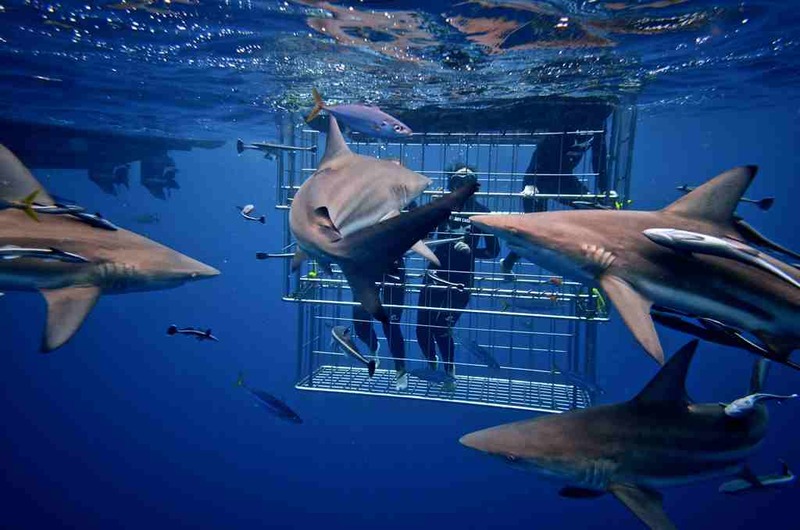 These protective cages are designed to prevent sharks from making contact with the divers and are intended to protect the divers from potential injury because these predators may get vicious and aggressive. The cages are custom-built for safety and durability. They are built to withstand being rammed and bitten by sharks. They feature maximum strength and functionality and utilize a 360-degree view throughout the cage. Hence, divers have the ability to see sharks clearly inside the cage while staying completely safe. The cage floats on the surface just next to the boat guaranteeing easy and safe entrance and exit anytime. 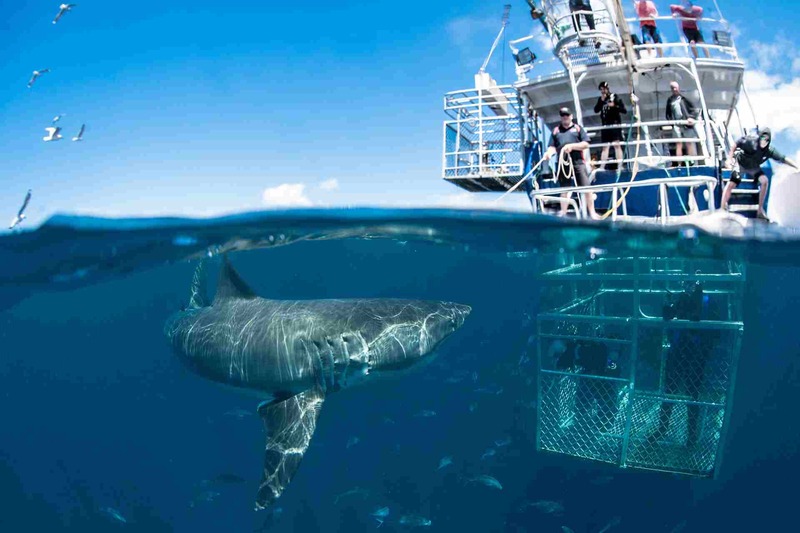 Because shark cage diving trips usually last for approximately 3 to 4 hours, it is required that the boat used for the trip should be in good condition. The boats of the operators in Cape Town are all inspected by the South African Maritime Safety Authority and conform to their standards. The vessels are also checked periodically to maintain speed, stability, and safety. Additionally, all the necessary equipment are onboard like fire extinguishers, first aid kits, life jackets and life rafts. Swimming gears such as wetsuits, booties, and masks necessary for an effective time in the water are provided during your trip. Wetsuits are necessary to help you stay warm during your underwater encounter. Towels and waterproof jacket are also provided during your trip to keep you dry. Most operators provide breakfast, snacks, and lunch, so you won’t have to worry about bringing something to eat. Bring your swimwear. Do not forget your dry clothes for after cage diving. Also, bring sunblock to avoid sunburn and sunglasses to protect your eyes. It also helps to bring warm jackets with you. For those prone to seasickness, bring anti-nausea medication. While a cameraman is on board to capture all the action, it is highly recommended that you bring your own camera. Do not forget for batteries and extra memory card. Now that you know everything you need to go shark cage diving in Cape Town, we hope that you will enjoy your close encounter with the Great White Sharks. The Great White Shark is a species of large mackerel shark which can be found in the coastal surface waters of all the major oceans. The Great White shark is one of the world’s largest known extant macro predatory fish. It is one of the top predators of marine mammals. It is also known to prey upon a variety of other marine animals, including fish and seabirds. Great white sharks are found in almost all coastal and offshore waters in all major oceans, especially those bodies of water surrounding South Africa and Australia which have water temperatures between 12 and 24 degrees Celsius. Gansbaai is being named the Great White Capital of the world because it has one of the densest known populations of Great White Sharks. It is best-known for its prime shark researching, viewing and cage diving opportunities. Gansbaai’s economy still revolves around its fishing industry, but an increasingly large part of it now comes from tourism. 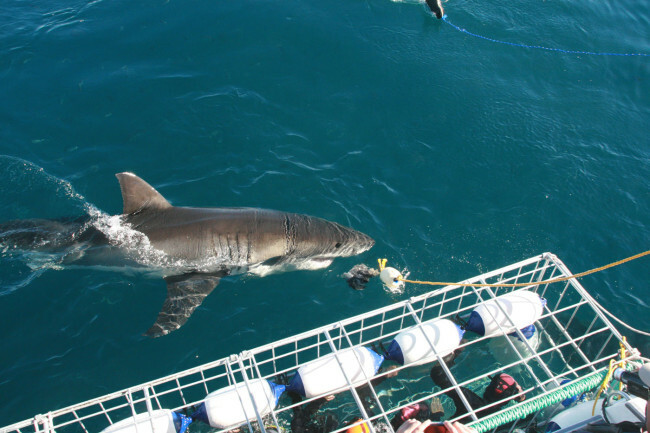 The main tourist attraction in Gansbaai is cage diving with great white sharks. Great White Shark cage diving trips are offered throughout the year. The waters off of Dyer Island in Gansbaai are known for their exceptional Great White Shark populations. Dyer Island is situated five nautical miles off the coast of Gansbaai and is arguably one of the best places in the world to get up close with the Great White Sharks. It is named after Samson Dyer, an immigrant from the USA to the Cape Colony in 1806, who lived on the island collecting guano, which he sold to mainlanders as fertilizer. Running between Dyer Island and neighboring Geyser Rock is the Shark Alley. The Shark Alley is the most highly populated area in the world for Great White sharks, who hunt from the colony of approximately 40,000 Cape Fur Seals inhabiting at Geyser Rock. Shark Alley has been the subject of numerous documentaries, including National Geographic, and makes it the most popular spot for cage diving and breaching. It is also considered one of the best places on earth to study great white shark behavior. False Bay is a great place for viewing great white sharks. It is just around the corner from the Cape Town city center. A large colony of Cape Fur Seals is found in False Bay making it a favorite hunting ground for the great white sharks. Tourists can get to experience the majestic great white shark up close during a cage dive or watch in awe as these powerful creatures propel themselves into the air while on the hunt for seals. It is best to book shark cage diving trips in False Bay during February to September because False Bay is out of season from October to January. 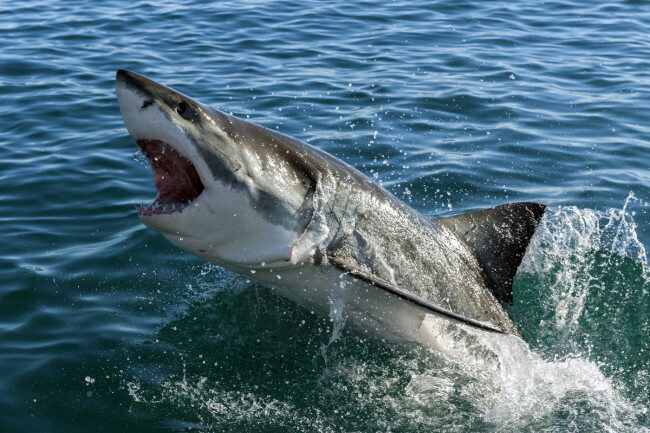 Great White Shark is attracted to the False Bay region as a result of two oceanic currents, the warm Agulhas Current, and the cold Benguela Current, creating a temperate zone just off the South African coast which provides ideal conditions for the Great White Shark in particular. Simon’s Town is a quick 45-minute hop around the peninsula from Cape Town‘s city center. It is a beautiful seaside town on the opposite side of the Cape Peninsula. This town features the country’s naval headquarters. There are a number of companies in Simon’s Town which offer various tours, including opportunities to see and dive with great whites, blue and mako sharks, and broad nose sevengill sharks. It is also the base for many shark dive operations to Seal Island. Seal Island lies just off the coast of Simon’s Town and is home to thousands of Cape Fur Seals. These seals attract predators like the Great White Shark and the Mako Shark making it a popular destination for shark cage diving operators. The unique Great White Shark Breaching takes place on this island. When talking about Cape Town, South Africa, the things that come into our minds first are the beautiful city surrounded by vineyards, wineries, stunning beaches, gorgeous mountains, and flocks of tourist activities all year round. One thing you don’t hear the locals talking about is what exactly is hiding below the water. 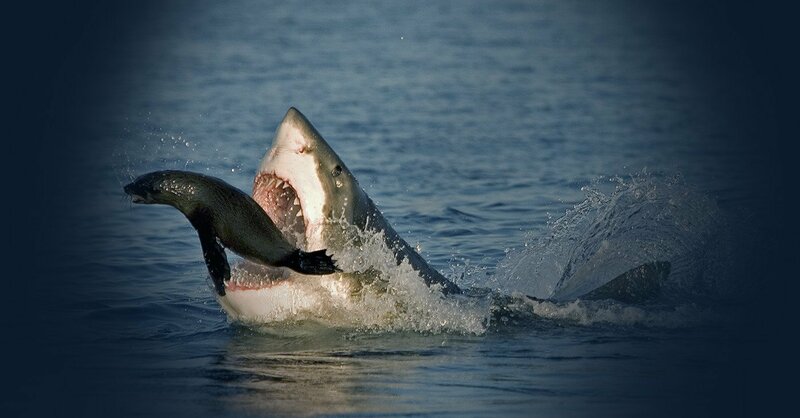 Below are great white sharks, one of the most feared creatures, which make oceans in South Africa their homes. Shark diving is defiantly the most well known industry in Cape Town. Home to around a quarter of the world’s shark species, it is the best place for underwater shark diving and shark snorkeling. Shark diving is really a wonderful activity to experience, it gives you the adrenaline, excitement and thrill which everyone is searching for. It’s an experience which also involves exploring the underwater world that is utterly spectacular, not to mention the ideal time to bond with your family and friends, although this bond may be based in fear. Cage diving is very much popular and it gives you the chance to conquer your fears and see the sharks face to face. Not only will shark cage diving give you a once in a lifetime experience to see the ancient hunter up close, but also understand how these mysterious creatures work in their own ways. 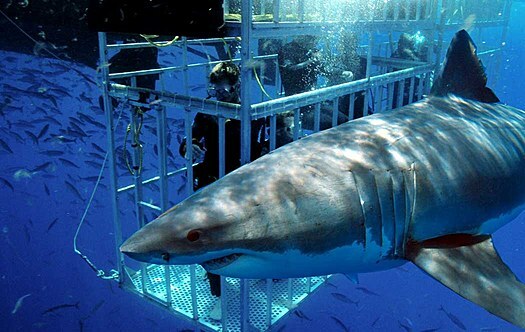 The cage dive requires you to wear scuba diving gear and to plunge into the steel cage as the water around you is filled with a blend of fish parts as well as blood in order to attract the great white sharks. The cage is kept at a shallow depth, mainly to stop the sharks from getting above it and also to provide divers ready access to the surface and the safety of the boat. Sharks are incredibly curious and these creatures often appear in a few minutes to check the cage as well as the divers a lot more closely. It is an amazing experience to witness these hunters of the deep working in their own natural habitat. Great White Sharks are officially listed as being an endangered species and thus they should be treated with high respect. A common day for any shark cage lover includes an early morning breakfast along with a ride into several coastal villages from which the expedition will start. The most common coastal town that shark cage diving tours are run from is Gansbaai. Safety factors are one of the greatest importance in shark diving. All the equipment is examined and double checked first and everyone that’s involved must undergo an orientation in the basic safety protocols which must be implemented during the expedition. Operators also consider this incredibly serious and must go through strict licensing processes to ensure a safe standard. Sharks carry an aura about them which causes most people to shudder in disgust, but at the same time in a way respecting the natural way that nature works its course. Sharks have to eat to live, and as long as it is not us that they are eating, watching them can be a fascinating pastime. That is why a shark diving Cape Town excursion can be an exciting and exhilarating experience for most people. And that is what you will get as you book a position on one of the boats that will take you right to the action. Actually, the people who sign up for these excursions are never in any danger at all, as one boat captain put it, “We have a 14 year perfect safety record.” And rightly so, as the “cage” that the viewers are contained in fits at surface level and it is strapped to the boat, so it is not going anywhere. Groups are limited in size in these shark boats to about 20 people and they leave their moorings in Cape Town at about 9:00am and reach their destination of Gansbaai around 11:30am to the shark infested area, which is a channel situated between two islands. The boat is a motorized catamaran which has been designed expressly for shark watching and cage diving. Once the boat is anchored in the channel area, the shark watchers, donned in their wet suits and goggles, climb into the cage. It holds six individuals, who are heavily protected by the steel bars on the cage, which floats on the surface and is attached to the boat. The shark watchers can dive one meter under the water, which is about 3.3 feet, but can never go near the outer edge of the cage. They have a continuous supply of air from hoses in the cage, or they can use snorkels to breath from if they wish. There is no diving certification required for the event as they are not free form diving and are confined to the cage. Chum is put out for the sharks in order to attract them. Sharks are not guaranteed to come, because you can’t always predict what they will do, but if everyone is patient and enough chum is distributed, they will come. Once the majestic white sharks arrive it is an awesome experience to watch them, especially when they are “up close” at the edge of the cage. Sometimes the will open their mouths very wide for a terrifying view of their teeth and huge gaping jaws which could make short work of seals, dolphins and us. They cannot get close, however and are more interested in the chum anyway. The people in the boat spend about a half hour in the water, and then they rotate with the others on the boat, so everyone gets a turn. 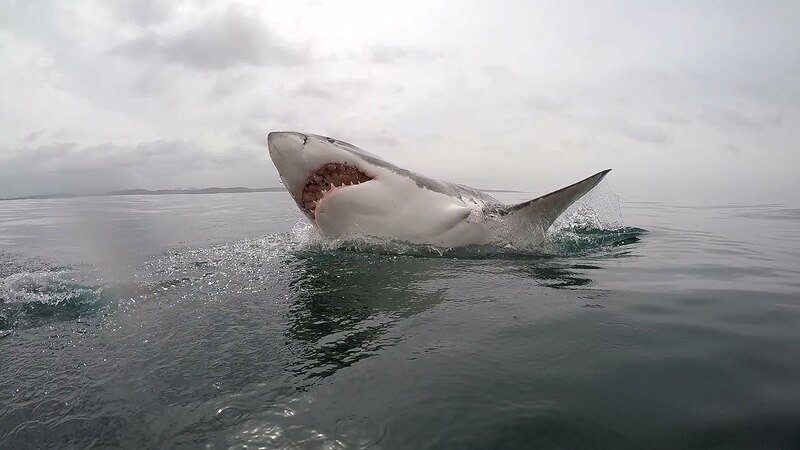 The great white sharks are surface feeders, so even the people on the deck who are not in the water have a tremendous view of what is happening. A shark diving Cape Town experience is one that no one will quickly forget as it is a once in a lifetime occasion. When it comes to the adrenaline rush type activities, shark diving Cape Town is definitely high on the list. So, if you’re the type of person that is always up for an adventure or new challenge, then I will definitely encourage you to go on a shark dive using a metal cage in order to get up close and personal with these amazing creatures. We will now look at a few reasons why this is a great idea. The first reason is that by going shark diving, you will be facing your fears head on. Yes, we all know that sharks can be quite dangerous and they have killed people throughout history. However they aren’t human killing machines since in most cases, they mistook the human for a seal. So, by facing your fears, you will actually become a stronger, more balanced person by going shark diving. Sure, you will probably be scared out of your mind, but when you’re done, you’ll be happy that you did it and faced your fears. Another reason why you should go shark diving is to simply look at these magnificent creatures in their natural habitat. Many people think its sufficient to go to a zoo and look at these animals in cages or large fish tanks. This is definitely not the best way to experience these animals, especially if you’re an animal enthusiast. There is definitely something awe inspiring to watch a great white shark glide one or two feet away from you and it is an experience that I highly recommend. Next, by going shark diving, you will gain an added respect and admiration for nature and the earth as a whole. We need more people who have reverence for the earth and by witnessing sharks in their natural environment, gliding peacefully through the water or devouring bait set by the tour guides, this will definitely inspire you to have a greater respect for the earth and its natural ecosystem. Also, in order to go shark diving Cape Town, you will have to actually visit Cape Town which is in Africa. Africa is thought of as the seat of mankind where the first human being was born. In my opinion, every person that has the ability to visit Africa, should do so at least once in their lifetime. Africa is definitely a magnificent country that will make a huge impact on you. There is no greater experience than traveling and I highly encourage you to step out of your safety net and explore the world. In closing, shark diving is an experience that will not only get your adrenaline pumping but will give you a greater love and admiration for nature, life and the world as a whole. If possible, you should try to get as many of your loved ones and friends to try it with you as it will definitely expand their horizons as well. So with that said, once you go shark diving once, I’m sure you will do it many times again! Diving with the sharks is going to be something that people will want to do. However, what people need to realize is their are certain areas that are going to be great to dive at, but only some of the locations are going to have some of the best sharks. This is when people should know about the great time they can have by shark diving at Millers Point and know more about the type of sharks that tend to be present in the dive they are planning on taking. The type of shark that is commonly found at Millers Point is often divided between a couple of different types of sharks. The common ones that are found are the broadnose sevengill sharks and the cowsharks. Both of these sharks are going to be rather large in size with 3.5 meters often being average. So the size of these sharks can be intimidating to some people as they are about the same size as them, except they are a lot more agile in the water. Normally people are going to find the sharks are going to be very docile and very inquisitive about the people that are in the water. So people will want to make sure they know about the different types of sharks because these are usually going to be one of the more docile sharks that people will be able to swim with. 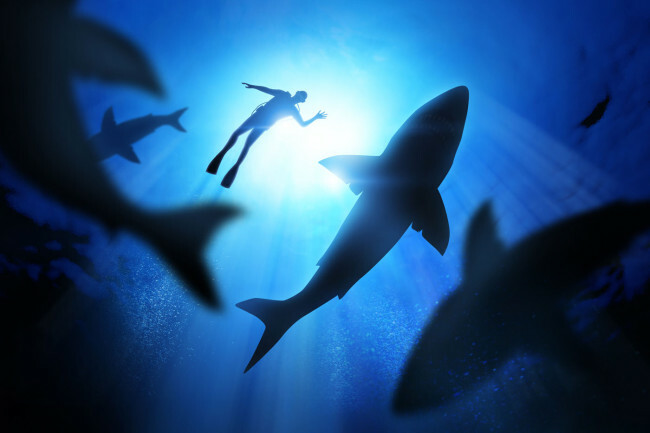 So people normally will not have to worry so much about the various shark attacks that can happen, like they may have read about in some of the other areas that are allowing shark dives. These are a shark that while it is very curious, it will allow people to have a great view of the sharks. These sharks will generally have a dorsal fin that is about three quarters of the way down their back. However, the sharks are often going to be gray in color, but they will have a different look because they tend to have some black and and white spots on their body. These sharks also tend to have something that is going to allow for their name to make more sense as they have a pair of seven gill slits, which is going to make it a lot easier for people to see why these sharks have the seven gill name. As with any type of diving, people are going to need to dive with their normal equipment and this is going to make it easier for people to avoid having to get any of the extra equipment that is needed. However, what people need to realize is Millers Point is a protected area so they will have to make sure they are going to get the proper permits to get the diving in the area and know they are not going to violate any of the laws. When people are looking at having a great time while diving and looking at sharks, they need to know about the different areas that are around. This is when people need to know more about the different types of sharks that are present and what is required for them to be able to dive at Millers Point. By knowing this information it is going to be easy for people to get the right time and know their diving is going to be not only fun, but educational at the same time.